Start or interrupt your hop-on hop-off sightseeing tour of Berlin at stop DomAquarée. The Lustgarten (Pleasure Garden) is a public park centrally located on the Museum Island. It is a very popular place to Berliners and tourists. In its center there is a huge red granite bowl. The Berliner Dom (Berlin Cathedral) is a Protestant church. It is located on the northern part of the Museum Island. The mighty dome is one of the largest Protestant churches in Germany and the largest church in Berlin. 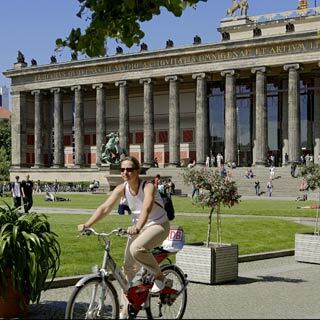 With its five museums the Museumsinsel (Museum Island) today is a much visited destination and one of the most important museum complexes in the world. The collections exhibited on the Museum Island range from prehistory and antiquity all the way to 19th century art. The unique ensemble in the heart of Berlin became part of the UNESCO World Heritage in 1999.